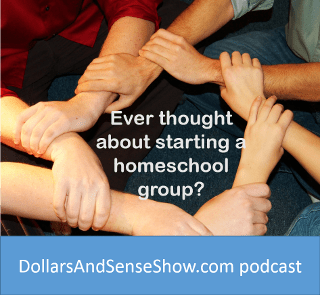 In this episode, Carol discusses how to start a nonprofit homeschool group. She shares her knowledge as the Homeschool CPA on important steps to take when organizing a group such as having a board and a clear mission. She’ll also share tips on how to legally operate your homeschool group. 1. Board: Chose a group of leaders so no one carries the burden of leading alone. 2. Bylaws: Write up bylaws to structure your group. Decide the Who, What, Where, How often and How much issues. In the bylaws mention its purpose (what), its members (who) and its leaders. The Where, how often and how much change frequently and do not belong in the bylaws. 3. Budget: Planning with numbers. Estimate your income and your expenses. Plan a small surplus for emergencies. 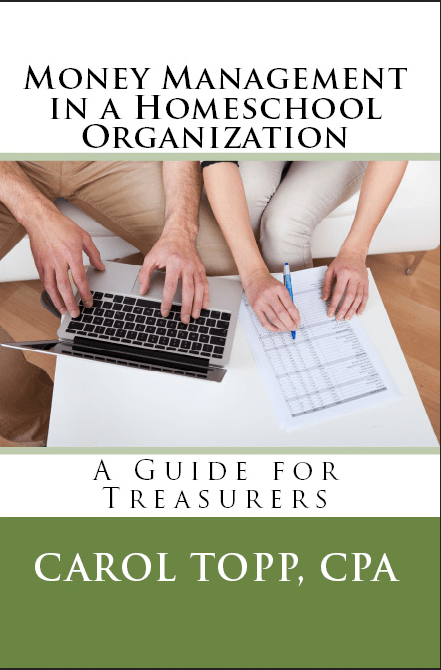 Carol’s new book, Money Management in a Homeschool Organization will help your treasurer create a budget and stick to it! Her newly updated book, Homeschool Co-ops: How to Start Them, Run Them and Not Burn Out. Tune in for the next Dollars and Sense show on December 19, 2013 when Carol will discuss tax exemption and how to get it for your homeschool group. I just spoke with the IRS about being entered into their database. I am frustrated. The first question she asked me was whether we have an organizing document. After I said we don’t, but are self declaring 501c7 status, she informed me that unless we have an organizing document, we don’t have standing with them and are not considered an exempt organization, so we wouldn’t file a 990N. How extremely frustrating the IRS can be! Articles of Association for unincorporated organizations. Articles of Incorporation for organizations that decide to form a nonprofit corporation in their state. Homeschool co-ops or other large groups frequently incorporate as nonprofit corporations in their state and go on to apply for tax exempt status with the IRS. 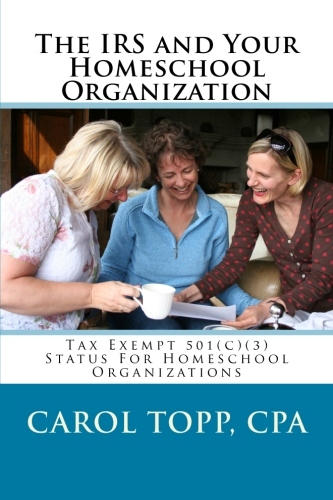 Your homeschool support group won’t ever send the IRS your “organizing documents” since you are self-declaring tax exempt status as a social club and do not have to file a Form 1024 to apply for 501(c)(7) status. But it’s still a good idea for a homeschool support group to have bylaws and Articles of Association. 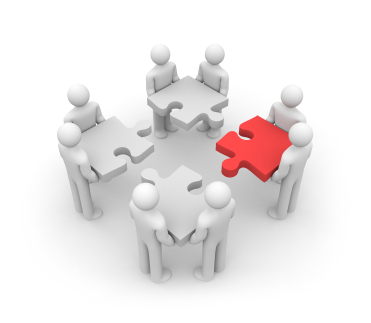 They spell out the foundation of your group’s purpose, membership, and how the board is chosen. Your homeschool support group could create bylaws or “Articles of Association” (I added a sample to my Sample Documents page) as your organizing documents. Your board should vote to approve the bylaws or Articles of Association, but you don’t have to file the document with the state or the IRS. Then call the IRS again, hope for another person this time, and see if you can get into the IRS database. 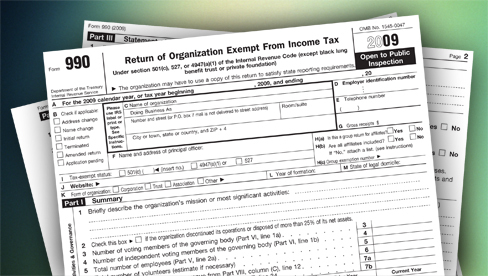 Since 2010, the IRS has required all nonprofit organizations file an annual information return. (all means all nonprofits, except churches) The IRS Form 990-N is a simple, online form that all nonprofit organizations with annual gross revenues of less than $50,000 must file every year. That means your homeschool group (unless you are under the ministry of a church). When is the 990-N due? The Form 990-N is due 4 1/2 months after the end of your fiscal year, so May 15 for groups that run on a calendar year. What does the Form 990-N ask? The Form 990-N is very simple. It is only 6 questions. No financial information is given. How do I file the Form 990-N? We’re not a 501(c)(3)yet. Do we still need to file the Form 990-N? Yes, you do. Start filing the Form 990-N even before you file for 501(c)(3) tax exempt status. File a 990-N even if you are a self declared 501(c)(3) social club. File the Form 990-N even if you are exempt from applying for tax exempt status because your annual gross revenues are under $5,000 or because your are a self-declaring 501(c)(7) Social club (like most homeschool support groups). Since you have not applied for 501(c)(3) status, you are not in the IRS database, so you need to call the IRS Customer Account Services at 1-877-829-5500 and be added to their database so you can begin filing the Form 990Ns. 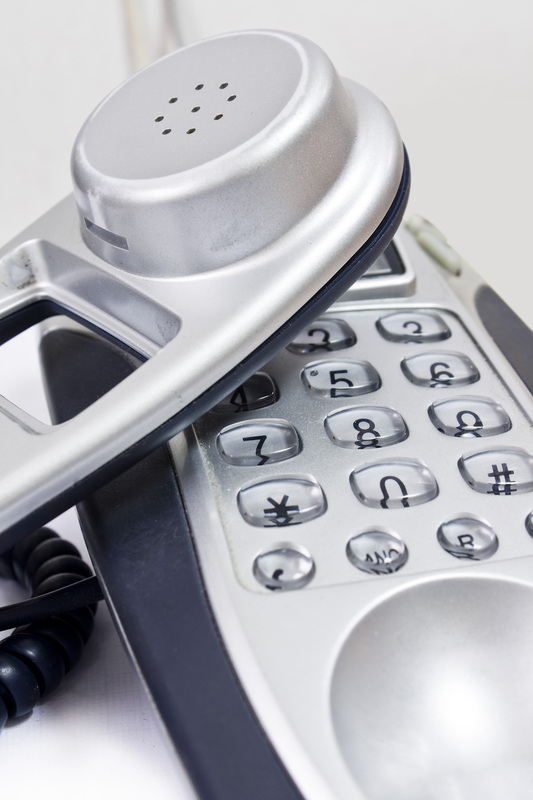 It typically takes 6 weeks after you call to be added to the IRS database. What happens if I file the 990-N late? The IRS will send you a reminder notice if you do not file your 990-N on time, but the IRS does not assess a penalty for late filing. What happens if I fail to file the Form 990-N for three consecutive years? If you fail to file for three consecutive tax years, you will lose your tax exempt status. This will occur on the filing due date of the third year. If you lose your tax exempt status, you must reapply for tax exempt status. This means filing the Form 1023, the new shorter 1023-EZ or 1024. (I can help with that. Contact me) and paying the IRS filing fees. You may owe taxes for the period when you were not tax exempt. The IRS requires that all organizations who lose their tax exempt status file the Form 1023/1023-EZ/1024 even if they were exempt from filing the form before. That means doing the paperwork and paying the IRS filing fee ($275 , $400 or $850). We’ve never filed any forms with the IRS. Why now? Before 2006, small nonprofits with annual gross receipts under $25,000 did not have to make any yearly filings with the IRS. But in 2006, Congress and the IRS introduced a new form, the 990-N. The IRS needed to clean out their database of nonprofit organizations, many who had old addresses or were closed. 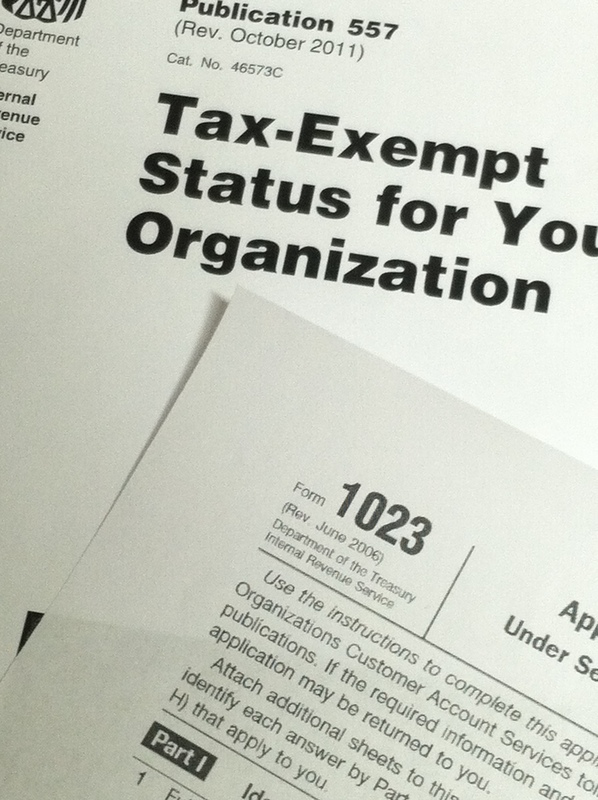 The Form 990-N keeps the IRS and donors up-to-date on tax exempt status of small organizations. Will we owe back taxes or penalties? There may be a period of time when your organization was not tax exempt. The IRS may expect you to pay income tax for that period. (I can help with filing your tax returns. Contact me) Fortunately, the IRS is not assessing penalties for late filing of Form 990-N. I have never heard of this before and now I think we’re in trouble! What should I do? 1. Stay calm. Everything will be OK.
2. Read my blog posts on Form 990N. 3. Discuss the situation with your board. This morning, Laura and I went to the bank to open a new checking account. We were told that in order to open our account we would have to register with the Missouri Secretary of State. We then went home and tried to register with the Missouri Secretary of State, and we got stuck because it asked us for our charter number, which we don’t have. Then, we called a different bank hoping to get some more information. We were advised by that bank to go on-line and File a Fictitious Name. We proceeded to try that, but then came to a page that asked us to enter the “owners” names and information. Laura and I are not sure if we are the “owners” and what that means exactly. We are also wondering if filing for a fictitious name is going to affect our status of being non profit. We would so appreciate any advice you could give us. 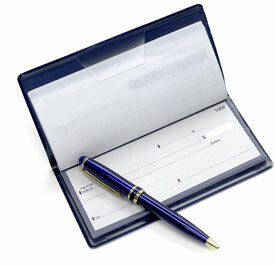 It seems so simple to just go and open a new checking account, but we just keep running into problems! Sorry you had so many problems with your bank! I think banks are notorious for giving out bad information. I answered a similar question on my blog post about fictitious name registration. You’re correct that you are not the owners. Nonprofits do not have owners. You should open the checking account with the names of the officers (usually president and treasurer) as check signers, but not owners. I hope you were very clear with the banks that you are opening a nonprofit checking account. It’s a summary of what nonprofits need to do in the state of Missouri. A lot of things are not needed until after you receive 501c3 tax exempt status. I am working with three friends to start a homeschool co-op this fall. I purchased your book and read over your website. I can see we may need your services in the near future. For now, however, I just have one question that I couldn’t seem to find an answer to in your material. I would like to apply for non-profit status with my state and the IRS. However, fees are discouraging right now. If we are charging parents to drop off for instruction 2 days a week and all that money is going right back into rent, materials, etc and no profit is made, can we just start doing that before we apply and then “save” money to apply for non-profit? And then if the answer is yes, what are we until then for tax purposes? Do we have to file taxes just as a business and just show $0 profit and $0 taxes owed? The IRS will grant you tax exempt status from the date you incorporate. It “back dates” your tax exempt status. You should not consider yourselves as a for-profit business if you are organized (meaning have a board and bylaws) and operate (no profit motive, no one pocketing the profits) as a nonprofit. You can call yourself an “unincorporated nonprofit.” That has a nice, official ring to it! You do not need to file a business tax return. So, the bottom line is that you can start and run your co-op for about a year, maybe close to two years, and then apply for tax exempt status with the IRS. I recommend getting nonprofit incorporation from PA first, maybe about 6-12 months before you apply to the IRS. After you incorporate, I strongly recommend you start filing the annual Form 990N with the IRS. It’s a simple 8-question online form. Start filing the Form 990N even before you file for 501(c)(3) tax exempt status. I’ve read your books and really appreciate the information. When you say you have 27 months from when you file with your state for incorporation as non-profit to file with the IRS, is that only if you want the IRS to grant 501c3 status retroactively to your date of incorporation? My concern is that I would like to file as a nonprofit with my state so I can get the protection afforded by incorporation but I don’t anticipate seeking 501c3 within the next 27 months and I just need to be sure that is not a deadline to file after becoming a non-profit with the state. Lately I have helped several nonprofit clients that formed years ago and were not filing the 990N each year. Now the IRS is making them go back and file corporate income tax returns, even though they have always been nonprofits. The IRS released a press release addressing common questions asked about the scandal involving the tax exempt application by several nonprofit organizations. As a CPA who helps nonprofit organizations apply for tax exempt status, I have followed this scandal with a lot of interest. The nonprofits applying for 501(c)(4) status did not need to apply; tax exempt status can be “self declared” by 501(c)(4) organizations. These groups went above and beyond what was required of them and were subject to long delays and inappropriate questioning. “12. Did mistakes occur in working the centralized cases? Let’s hope this scandal means the IRS tax exempt organization will have more efficient and effective processes in the future. Several families and myself have started a brand new homeschool group. Since we are new I am trying to do all the filings myself. I have already filed and been granted the non-profit corporation status for the state of Florida, acquired the EIN number and now I am trying to file for the 501( c)(3) status. Can you advise me on which forms I need to file to obtain the status? I have the 1023 form, but it looks like I need to file one of the schedules. 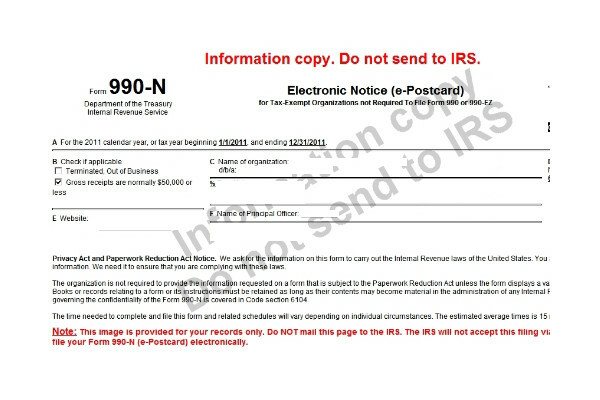 You’re correct that IRS Form 1023 is the application for 501c3 tax exempt status. Typically homeschool groups do not need to file any of the schedules for the Form 1023. A homeschool group might offer college scholarships and then they fill in Schedule H, but that’s it. Your organization can save money by doing much of the work yourself. I have helped more than 25 homeschool organizations obtain tax exempt status and you can benefit from my experience. Cost: $50/hour for approximately 2 to 4 hours (approximate total cost $100-$200). Time: 1-2 weeks. How much money can a homeschool group keep year to year? Is there a cap to how much we can keep in our checking account from year to year as a homeschool support group? No, there is not a cap on how much money a homeschool support group can accumulate. While it is prudent to have a small surplus to meet future needs, most nonprofits do not accumulate a lot of money year after year. 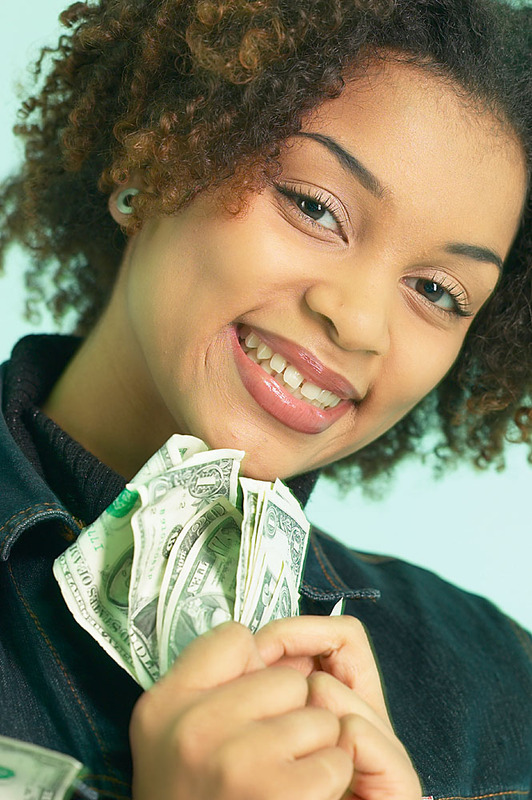 If you have plans for a big event in the future, then it is acceptable to accumulate funds for a few years. But without a reason to be accumulating money, the funds should be spent on your current members (but always keeping a small reserve). 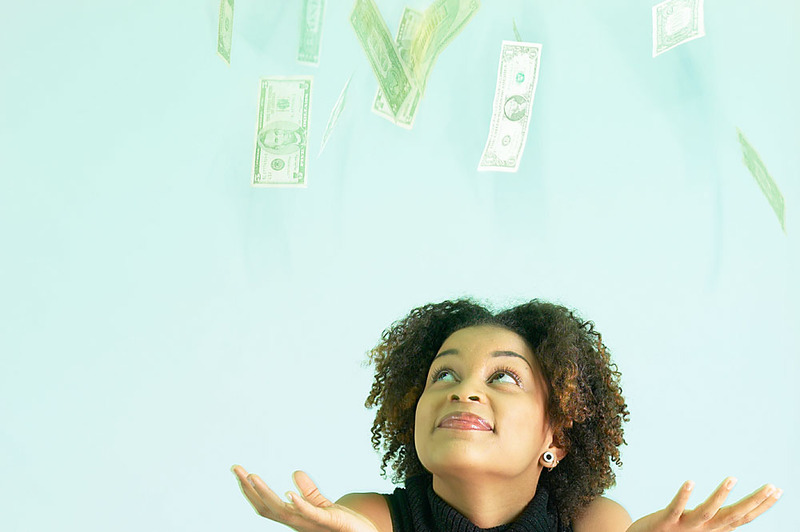 Having a budget should help you manage how much surplus you carry forward. Sad but true story: My support group leader realized she would end the year with a surplus, so she threw a very nice catered dinner for all the members and their husbands. It was a lovely date night with babysitting provided! Unfortunately, the leader drained the checking account and didn’t realize that the annual insurance bill was due in the summer before she had collect dues from the members! Ouch! She had to ask several members to loan the group money in order to pay the bills over the summer. Good planning, a budget, and carrying a surplus would have avoided her embarrassing situation. Do you have a copy of my ebook Money Management in a Homeschool Organization?